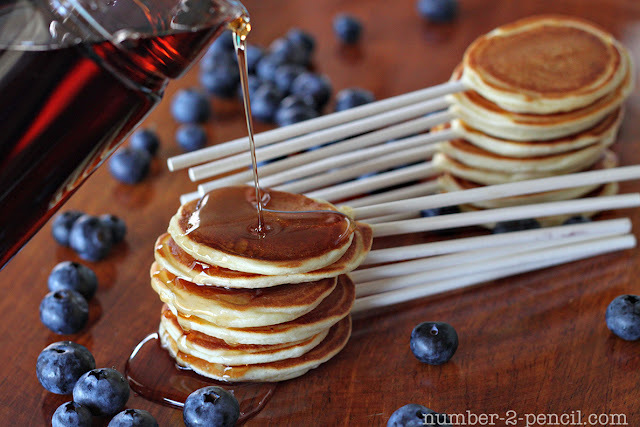 Juneberry Lane: 'Stick' to These Breakfast Recipes...No Utensils Needed! 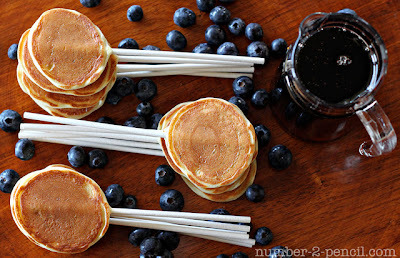 'Stick' to These Breakfast Recipes...No Utensils Needed! Growing up, we all enjoyed those yummy carnival foods like corn dogs, corn on the cob, and kabobs. Now as adults, we have been savoring sweet cake pops, pie pops, and marshmallow pops. 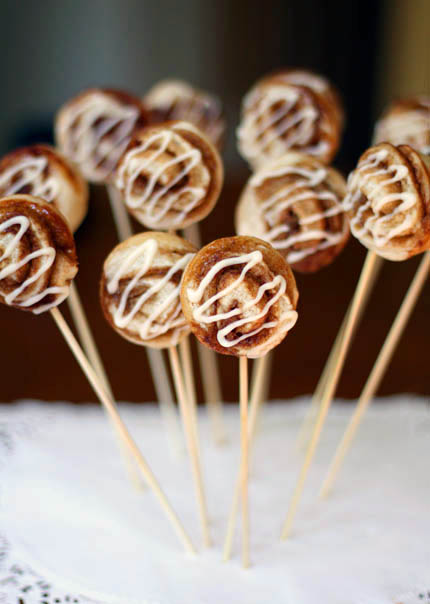 It's hard to believe how many of our favorite foods and desserts are served on a stick! These foods are so appealing because they are the perfect way to prevent spills and crumbs; even from the messiest eaters. 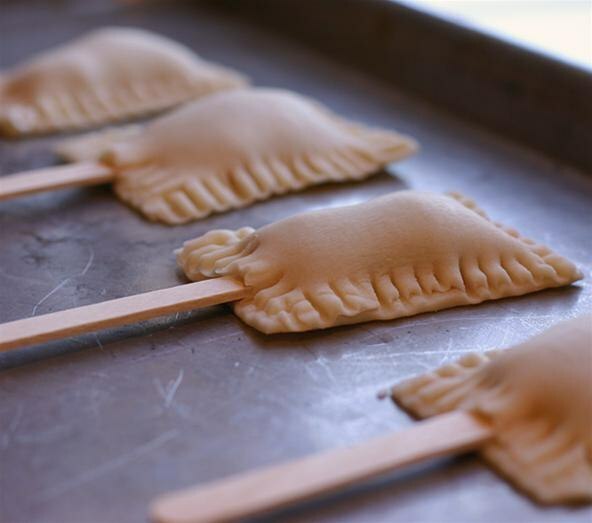 They are also a simple yet fun way to serve foods and get rave reviews at any summer party or event! But while there are a plethora of lunch, dinner, and dessert ideas that can be eaten on a stick, there is still one thing missing from the list...BREAKFAST ON A STICK! So wake up, brew a pot of coffee, invite some of your closest friends over, and enjoy a brunch filled with some of these scrumptious breakfast staples on sticks . . .
1. Combine flour, sugar, baking powder, baking soda, and salt in a large bowl and whisk to combine. Add Greek yogurt, butter, and lightly beaten egg to the same bowl. Add enough milk to make the batter stir-able (1-2 Tablespoons depending on the thickness of the yogurt). Stir until just combined. You will have a very thick and creamy pancake batter. 2. Scoop out a heaping teaspoon of pancake batter. Drop the pancake batter onto a hot griddle. 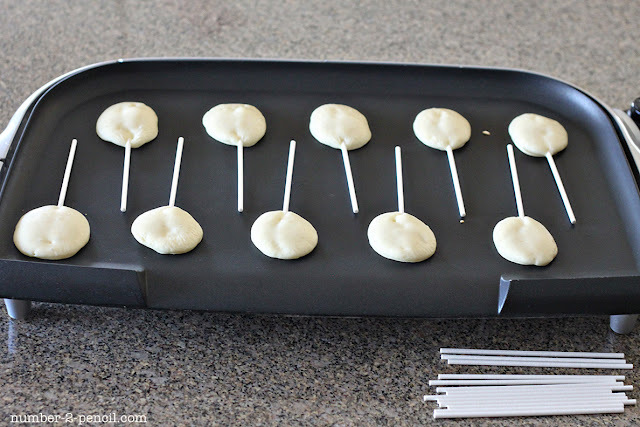 Give the pancake about a minute to set up on the griddle side so the lollipop stick won't go all the way through. Then place the lollipop stick in the batter just shy of the top of the pancake. Press stick down and use your spoon to smooth out the valley in the batter, that way you will have pancakes that look perfect on both sides. Space the rest of the pancake pops out, so you have room to add the sticks. 3. They cook really quickly since they are so small. About 4-5 minutes on the first side, and around 3 minutes of the second side. Once the edges start to dry out, they are ready to turn. 4. To flip the pancake pops use a small spatula to lift them a bit, then you can use the lollipop stick to give them a quick turn. The lollipop stick will be warm, but not too hot to handle. Just be careful not to touch the griddle. 5. Once they are finished cooking, pile them on a platter and serve with your favorite topping (fruit, nuts, chocolate chips, or whipped cream) and warm maple syrup. 1. Preheat oven to 400 degrees. In a small saucepan, combine cherries, sugar, corn starch, and almond extract. Heat on stove over medium heat until mixture has thickened. Remove from heat and allow to cool. Unroll pie crusts and use a pizza cutter to slice them into 1 1/2 " x 2" rectangles. You can use a ruler to measure into equal sizes. Just use a butter knife to score your pie crust before cutting. 2. Place wooden popsicle stick on the top of one of the cut rectangles, then spoon a small amount (about 1 1/2 teaspoons) of cooled cherry filling, into the center of the pie square, taking care not to get it near the edges. Gently lay a second rectangle over the top of the cherry filling. Press the edges of the rectangles together with a fork. 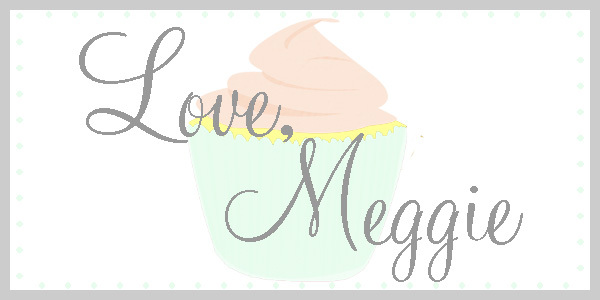 Transfer to a baking sheet. 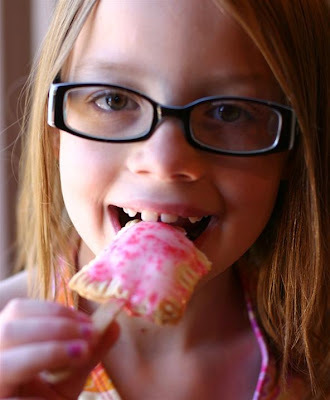 Bake Pop Tart Pops for 8-10 minutes, or just until the edges begin to brown. 3. In a small bowl, combine powdered sugar, milk, and vanilla to make glaze. Tint with food coloring, if desired. 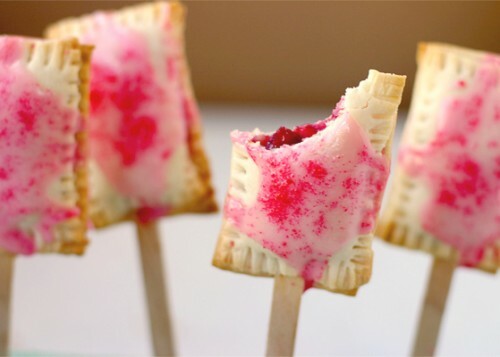 Spoon over cooled Pop Tart Pops, sprinkle with colored sugar, and allow the glaze to harden slightly before serving. 1. In a bowl of the electric mixer (with a dough hook attached), empty the yeast packets and add the warm water. Let stand until creamy and slightly thickened (approximately 10 minutes). In a small saucepan heat the buttermilk until it is warm to the touch. Pour the warmed buttermilk and the oil into the yeast and mix well. 2. In a medium bowl, combine the flour, salt, and baking soda. 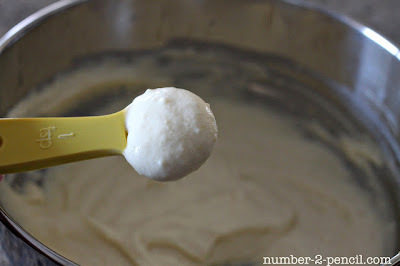 Stir the flour mixture into the liquid mixture 1 cup at a time, until a soft dough forms. Turn dough onto a lightly floured surface and knead 20 times. Cover the bowl with plastic wrap and let rest for 15 minutes. While dough is resting, combine melted butter, brown sugar, and cinnamon. 3. Cut the rest dough in half, and roll it out into a large rectangle on a lightly floured surface. 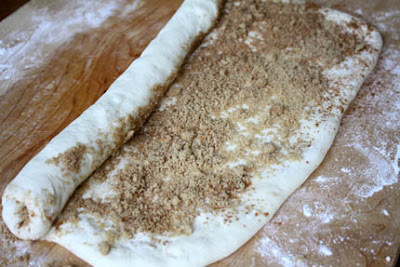 Spread the cinnamon-sugar-butter mixture over the dough and roll it into a log. Pinch the seam to seal. The diameter of the log will have to be the width of a mini muffin tin (approximately 1 inch). Thin out the log, if necessary, by stretching it out with your hands. 4. Either use a pair of kitchen scissors to snip off 3/4 inch wide discs , or use thread or unwaxed floss to wrap around the log and tie a knot to cut slices. 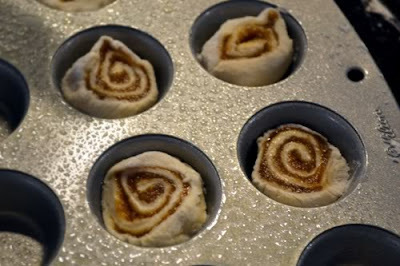 Place slices into greased mini cupcake tins and wrap with plastic wrap. Let rest for 30 minutes (or cover and refrigerate overnight). Repeat with the other half of the dough. 5. Prepare glaze by placing sugar in a medium bowl and whisk in heavy cream and vanilla. Add milk one teaspoon at a time to achieve desired consistency. 6. If baking right away, preheat oven to 325 and bake 12-16 minutes, until lightly golden. Let stand approximately 2 minutes before removing from tin with a spoon. Insert lollipop sticks. 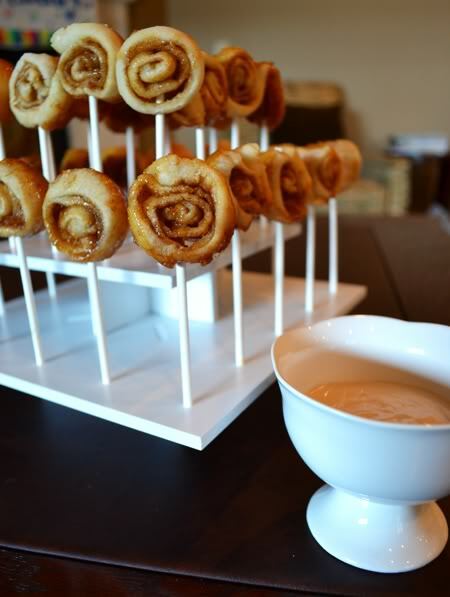 Either pour prepared vanilla glaze into a dipping bowl for serving or spoon and drizzle over cinnamon rolls. What a delicious way to start your day! Think of all the possibilities that these fabulous recipes can be used for...a special breakfast for your kids' first day of school, a romantic breakfast in bed for your sweetie for your anniversary, or the perfect pick-me up for your children and their friends the morning after their next sleepover. So, add these tasty breakfast treats to your morning menu and remember...no utensils are needed! Have a wonderful weekend! I love the idea of pancakes-on-a-stick! Will popsicle sticks work ok, or do they have to be lollipop sticks?